I had my calculus kids fill out a survey that I wrote — with their thoughts about what’s going on. I usually leave things like evaluations to be narrative, so students can say what they want to say without my questions leading them along. However, for this, I had some specific questions I wanted answers to. Now, before you read the survey, or start critiquing it: I know some of the questions are leading. And what the heck is the difference between “pretty interesting, often wild” and “sort of wild, sometimes interesting”? (You’ll see.) Whatever. It’s informal, and I’m cool with it. I so far have 22 of the 27 kids in my class responding, but since it’s Sunday and I won’t have time to do this during the week, I thought I’d give the preliminary responses. This is actually pretty nice. If you consider a 3 to mean they are indifferent, then I’d say most students find this philosophy attractive. You’d think I’d be slightly disturbed by this, but in fact, it is a relief. I feel like sometimes I teach to the lower end of the spectrum, instead of the middle or higher end. It’s that thing in me that wants to reach every kid. But I’ve been feeling like we’ve been moving slow, and it’s nice to know that others in the class feel that way too. I get to pick up the pace! Which is what I’ve been wanting to do anyway. Phew. This is expected. I felt a few more kids would say that it was easy, but on the whole, expected. 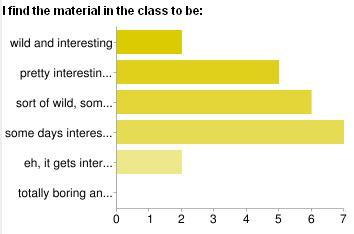 I struggle with making class interesting, to draw them in, to capture their interest. I am just not there yet. Many students in my class love learning, but haven’t yet ever loved math. They’ve struggled. This is a class they’ve decided to challenge themselves with. To test themselves. Or for college. Or because they’ve been told they had to. But it’s hard, and it’s rigorous, and a totally different way of thinking for many of them. Procedures aren’t as available (though they are available) to be crutches for many things. Concepts are king. Wait, this is me (a) rambling and (b) making excuses. I’ll see if as the year progresses I can’t get a few more of them to find what we do wild and interesting. This was expected. 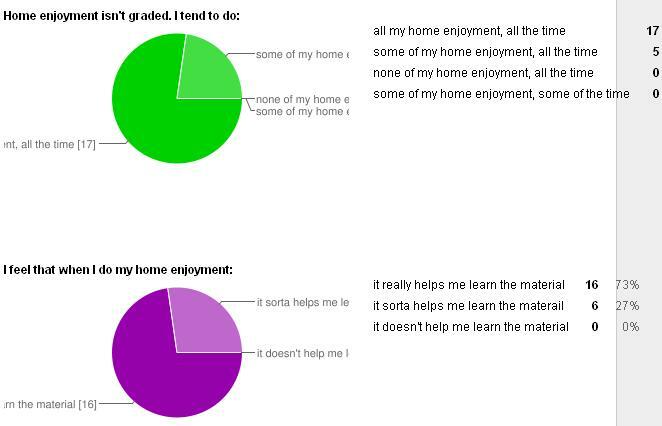 Most all of my kids do their home enjoyment (our super corny word for homework). The ones that don’t, well I think some of them should, and honestly, some of them don’t need to. Doing the home enjoyment is required, and I’ve made that clear. And they are expected to do it professionally and with integrity — whether it is graded or not. But I might soften my stance and tell students to only do what they feel is necessary to master the material. I know some other SBGers are like “duh, we already do that!” But I guess I wasn’t quite comfortable with saying that, until I saw how students responded to this. Statement: “I really know my strengths and weaknesses better because of the new grading/feedback system in calculus. And I can now do something about the weaknesses while basking in the glory of the strengths.” Do you agree or disagree? Discuss. I agree with this statement, because due to the new grading, I do actually know my strengths and weaknesses, and I can really focus on that while studying for the next assessment. I disagree with the idea that I didn’t know my strength and weaknesses without this system, but this gives me an opportunity (and the motivation) to learn something I didn’t understand the first time around. Agree. Well, I don’t feel like I’ve had any major comprehension issues yet, so any mistakes I’ve made are more procedural. This means I haven’t really needed to take advantage of the system yet, but I like it a lot anyway. Yes indeedy ! Because you have to plug in your scores onto the skill checklist you can really visualize your grades. You can see the areas you struggle in and the ones you excel in. Also if you do well in a skill and dont do so well the next time you know exactly what you need to do because it is on the skill checklist. Because of the new grading system, I defnitely have an easier time discerning which parts of calculus are my strengths and which are my weaknesses. It helps me to isolate conceptual misunderstandings and address them accordingly. Whether that’s re-doing homework problems or going over class worm, I feel more productive because I’m sure that I’m bettering myself as a math student. i agree but there are certain problems where i have made really simple mistakes and because i only have two free periods its hard for me to find time to make it up. I agree with this for the most part. I feel like my biggest weakness is retaining everything old while learning new things (I don’t think the information causes as much trouble individually) so my biggest challenge is making sure that I keep up with the past things and don’t dig myself into a hole! But I think that I understand this about myself more now with this system which allows me to really find ways to be aware of this and fix mistakes/hold on to information. Agree. Because of the system, I can see what I can do with no problem and other skills that give me a little trouble. I know that there is one skill that is consistently bothering me and the system allows me to work on it and make it stronger. Agree, you really have to learn the material and it’s helpful to have a second chance to prove you really know it. Agree, the reassessing does force me to understand the things I don’t know and remember the things I do. AGREE. My weakness is definitely learning material for a test and then forgetting it (which ironically is what I HATE in school…) and also I have a hard time making appointments to reassess and such. I agree with this though I dont think this grading system shows any of your effort. Thats the largest flaw. Somewhat disagree, I like that this new system lets you retest, yet at the same time I feel like this system really punishes you for making a silly mistake. There’s a massive difference between an 87 with a 3.5, and an 100 with 4, so I see it as everyone needs to do perfectly to really get a great score. I full agree that it helps students understand what there strengths and weaknesses are, but the assessments are so often that it’s hard sometimes to fully grasp the skills. Why else would so many students be re-assessing? Also it would be nice to review every once in a while in case those old skills coming back. ABSOLUTELY. For once I’m not totally screwed in a math class because of tests. I totally agree with this statement, because it gives me a chance to see whether or not the mistakes I make are conceptual or careless, as if I get a grade that isn’t satisfactory, I am forced to look at it and see why I made that mistake. Also, being able to reassess proves not only a potential further understanding of the concepts, but also proves that we are willing to put a lot of effort in order to make this system work for us. I definitely agree that the breakdown into skills shows me exactly what i need to work on and what i have totally down. However, occaisionally the system backfires; for example, if i had a 4 on a certain skill each time i was tested on it and i was having an off day when you tested me on it at the end of the quarter and got a 2, my grade wouldnt reflect the fact that i had consistantly mastered the skill, rather it would reflect one off day. Still, overall it is a good system. I agree with this statement. The new grading system really allows me to see which skill i lost points on through the grades on each assessment. Therefore, i will be able to focus on improving whatever specific skill i was weaker in. I agree, the new grading system does help me know where my strengths and weaknesses are, so I can do something about the weaknesses. However, as the year goes on it will be more and more difficult to retain all of the skills some strengths might become weaknesses. Then, to help re-make them strengths, it will add more stress to the stress of learning new skills and mastering other weaknesses. Statement: “When I have trouble in Calculus, I have found some good ways to overcome the difficulties because of the new grading/feedback system in calculus.” Do you agree or disagree? Discuss. I don’t agree because when you’re told to review all the material, it’s a lot to review and therefore you have little slip ups which because everything is repeated can really affect your grade and we have college stuff to worry about. It’s a lot on our plate. Due to the new grading in class, I have found new ways to overcome difficulties and study in general – instead of studying things that I got wrong, I can study the things that I genuinely don’t understand, so that I can get it right during the next quiz. Yes, I go to my peers a lot (especially [redacted]) and get help. I think that your comments on our tests are really good because I’ve been able to understand exactly what I did wrong, but I don’t know if that has to do with the system or not. I agree, for the reasons mentioned above. I would agree, because I think I talk to people more (you and classmates) when i’m confused before or after a test. Disagree. The new grading system is helpful in seeing what your strengths and weaknesses are but it doesn’t necessarily provide new methods to learn your stuff. You still have to develop your ways to learn the skills; the system just tells your weaknesses. I haven’t had any real troubles in Calculus, yet. But the little details I do leave out, I can go back and see the correct way of doing it without just racing ahead. Agree! after I figure out my mistakes, it becomes much easier to correct them which makes the reassessments awesome! I’m still having a hard time with that mostly because I’m really busy and I’m trying to keep everything under control. But when I have trouble I ask a friend or see Mr. Shah! The grading system hasn’t really added or subtracted in my overcoming difficulties, the idea of separating everything into “skills” is a good way to differentiate areas of concern though. I’ve figured out that the best way to review is know what you did wrong and to explain it in class. The new grading system helps, but I can’t quantify the amount it has helped. I don’t think it’s a major factor into overcoming difficulties. What I have done to overcome my difficulties is retake the problems that I didn’t do well on before the next time I reassess. Also, on occasion, I’ve met with kids to discuss concepts. It isn’t difficult to do, and, even though it’s more work, it’s more convenient. Yes i agree, the grading system shows me exactly what i am messing up which makes it much easier to target the mistakes and fix them. I don’t really have many difficulties, but I assume that if I did having the skill lists would help me see what I need to work on and overcome the difficulties. I think the new grading system really only helps me overcome my difficulties because i have another shot if i don’t do well the first time, which will motivate me to want to learn the material even after the test on it. I disagree. The new grading system doesn’t really give me any new ways to overcome difficulties. I can still apply the same skills to overcome them with another grading system (asking for help from a friend, using the web, getting more practice problems, etc.). The best thing is the fact that you can get feedback on exactly what you did wrong, and reassess if necessary. Making a mistake isn’t that big of a deal, because you have a second chance, and also I really know that I know it. It grades you on WHAT YOU KNOW and WHAT YOU DONT KNOW! Reassessments help give students a second chance to prove just that, and it encourages learning from your mistakes. That I can for the most part take the time to digest the information and if it doesn’t work out the first go around work on how to digest and understand it better for round two. Also, I’m less anxious at assessments because its like “ok show that I know skill blank blank and blank, and then remember the old stuff which we did great last time so it will be ok!” and that mindset helps me stay relaxed. You can keep trying untill you sucseed! How our performance in this class really is in our hands. Our effort can clearly be seen through our marks, which is something I really appreciate, and is also very rare when it comes to education of any sort.. It focuses on retention which, while difficult, is really important in a math class and will probably serve us well later in the year. Breaking topics down into specific skills makes it much more easy to mentally manage. Doing poorly on one assessment doesn’t overwhelm me and discourage me from thinking that I don’t know a topic. I can pinpoint my weaknesses and take them on one at a time. How the assessments are usually relatively short. The hardest thing about the new grading system is retaining everything that I learned. You have to really show that you know how to do the problem, not just give the answer, so it takes a lot longer to take tests. It’s easier to do badly because you’re graded on a 1-4 scale, as opposed to a 1-100 scale. even though a 3/4 is knowing the information it is technically only a 75% which is not a B so i struggle deciding whether i should spend my two frees trying to reassess the 3 or not. Making sure to stay on top of old mistakes and take care of reassessing right away instead of waiting it out/hoping it fixes itself over time with out doing something. Keeping in track of everything. You can’t be lazy to do well. If you want to do well, the teacher isn’t going to hold your hand through it. Having to make the effort to set up a re-test. you would think hw would be it but it isn’t because I am used to always doing my math hw and deciding not to do it would just be stupid because then I would get extremely confused. Making lots of appointments to reassess. If you do a great jobb one day and get everything right then one day your brain stops working and you do poorly. The hardest thing is easily that small errors earn big penalties. On these tests, a quick error could get you a 3/4, or a 75 as most of us see it, which is both unsettling and discouraging. It’s nice to know that you can always reassess, but it’s also nervewracking that you could just as easily do well on a reassess, have the same problem on a new test, make another dumb error and go right back where you started from. Probably how much effort it requires. We’re very busy as is, and this additional work, although beneficial, does add up to a lot. The fact that the scale is only out of 4 points. That means that a 3.5, which reflects almost perfect mastry on the skill, is still only a B+, something that is misleading and not totally fair. Knowing when to reassess. Say I get a 3 on a skill but a 4 on most others, I don’t know whether that means I should reassess the 3 or just move on. Some guidelines might be helpful on this. The hardest thing about the new grading system is that as the year progresses we have to retain old skills while trying to balance learning new skills. Through our years of high school we have learned to keep the old skills in the back of our minds (until the midterm or final) but now we are trying to change our learning habits around in 12th grade, which has been pretty difficult so far. It is definitely a good idea but it would have been a lot easier to deal with if we learned it earlier on in our educational careers (and/or if all the classes had the same grading system and not just calculus). Also, homework and class participation should be factored into the grade so more students would do it, so the class couldn’t be slowed down by those who don’t understand the material. What’s clear is that I still have some work to do with them, in getting them to see the new system as something APART from grades, and more about learning. My kids haven’t yet come to the place I have — and that makes sense because I’ve been thinking about this for a year, and they are just getting used to it. The fact is, many still see a 3.5 (out of 4) as an B, and a 3 (out of 4) as a C. I realize they aren’t looking at the totality of their scores holistically. I mean, on a test on linear regressions and got 4 out of 8 points on a word problem, they wouldn’t say “Oh, I got a 50% on linear regression word problems.” They have come to see these 2s and 3s as less like markers of understanding, and more like points on a test. Which makes sense. And now that I know that, I can address that. What’s clear is that my kids are very grade conscious. Heck, I was too when I was in high school. And they have good reason to be grade conscious. With regards to the fear of retention, I totes get that. But I don’t think they realize (even though I mentioned this) I can only test a quarter’s worth of material — once the quarter ends, I need to enter final grades. Those skills are shut out. But what’s interesting is that when I put old skills on their assessments, I choose ones where students generally didn’t do so well. And almost universally (with a few exceptions here or there) students either keep the same score on the skill or go up (sometimes dramatically). The one statement that shows me how much we’ve trained our kids in our schools to think about learning: “I dont think this grading system shows any of your effort. Thats the largest flaw.” Because if there is a system that actually shows your effort, and rewards for your effort, this is the one. If you can make this much progress with students that have been so successful in the old system, you are doing something right. This is an impressive amount of progress with your students. You’ve done a fantastic job communicating with them. These are fantastic stats and comments – that level of student insight is really remarkable. Great work! What I’m hearing as a common theme in the student narratives is that students see SBG as a great way to diagnose their strengths/weaknesses, but that it doesn’t give then the strategies they need to figure out the material–other than the ability to better target their study topics. My reaction was a “well, YEAH”. But it reinforces something I’ve been suspecting for many moons: that students don’t generally learn good tools for studying in their classes at school. I think it’s neat that your calculus students are confronting this now, ’cause they are certainly not going to be taught them at college. It might be powerful to have students share the things that are working for them. Study partners/teams, coming and talking with you (a la “office hours”), etc. Seriously, though, congratulations. The thoughtfulness of their responses tells me that they are responding to your hard with with engagement of their own. Your work is paying off. Keep going!